Game description: This title largely borrows from the novelties introduced in Guitar Hero: World Tour, with band career modes for single or multiple players with a storyline drawn as a cartoon, competitive modes online, and the possibility to play with different instruments such as a regular guitar, a bass guitar, drums, and doing the vocals. The storyline describes how a band wants to follow in the footsteps of the Metallica and become a leading act on their tour. This edition adds an Expert+ difficulty mode where players need to drum using a second bass pedal to mimic the playing style of Lars Ulrich, the drummer of the band. The members also did motion capture sessions for the avatars in the game. The music selection consists of 28 master recordings and 21 additional songs by others selected by the band. Bonus features include various videos and trivia about the songs. Progress is made by completing sets of songs, rather than a series of gigs as in Guitar Hero: World Tour, set in venues that were in important in the band's career. Performances are rated with stars and a certain amount is needed to progress and unlock a new set. The game also includes the GHTunes from World Tour where new songs can be created and shared. A new Drum Mode offers the possibility to play the drums without an existing drum track to create new rhythms, and the Battle mode (from Guitar Hero III: Legends of Rock), has been updated with Metallica influences for the power-ups, with names like Fade To Black, Under The Ice and Ride The Lightning. 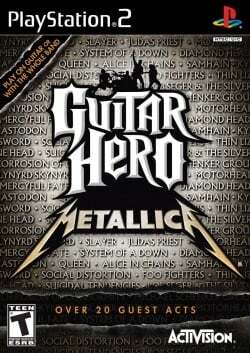 Similar to Guitar Hero: Aerosmith, Metallica presents songs from Metallica's history roughly in chronological order, but it focuses more on the group today than the band's history. Picture is sliced in gsdx hardware mode. Looks fine in software mode. Very slow running game. This page was last edited on 17 November 2016, at 20:48.